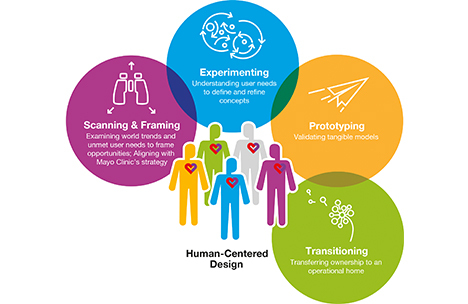 To design clinical experiences that meet patients’ needs, Mayo Clinic must understand those needs. The Center for Innovation (CFI) uses a defined methodology to bring discipline and focus to the work of innovation. Housed on the 16th floor of the Gonda building in Rochester Minnesota, the Center is a giant incubator — a space for nurturing new ideas, enabling them to grow, mature and evolve until they are ready for the patient. The Center also has teams at Mayo’s Arizona and Florida campuses, fueling the growth of innovation in those sites. Not only does CFI observe patients and providers, interview families, and conduct traditional consumer research, the Center also visualizes, models, prototypes and tests possible health care delivery solutions, creating innovations that will transform health care delivery. These sensibilities could include empathy, creativity, ambidextrous thinking, systems thinking, a human-centered focus, and deep curiosity about the world. Design methods include ethnographic and observational techniques, visualization, prototyping, sketching, storytelling, and brainstorming. 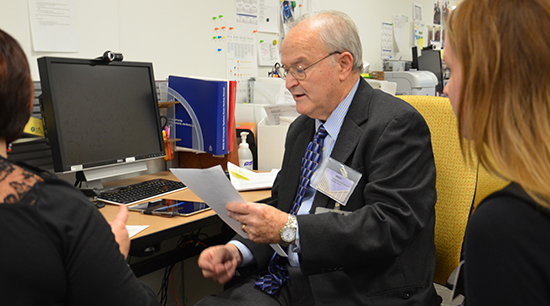 The Center’s role is to transform the experience and delivery of health care with a patient-centered focus. It offers a multidisciplinary team to turn innovative ideas for medical practice into practical solutions that change how patients receive health care – a medical transformation. To work and think differently, people need spaces to facilitate innovative work. The Center for Innovation has created places within Mayo Clinic to better engage with patients, providers and project participants. The Center is located among patient care floors in the Gonda Building, and includes glass-enclosed, reconfigurable areas along with large collaboration spaces. It’s designed without walls to allow for greater team collaboration and transparency between projects and those working on them. 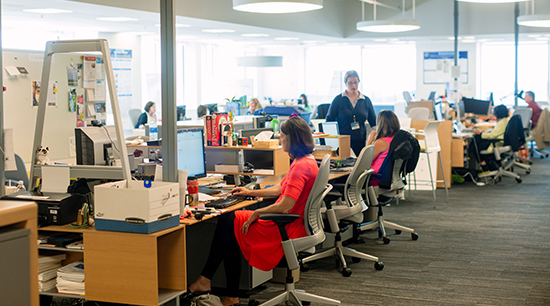 The space supports a multidisciplinary team with combined individual desk space and larger, shared team spaces. With built-in drop-on spaces, stakeholders and project collaborators can easily sit with the team when needed. Under the leadership o f Michael D. Brennan, M.D., Endocrinology, and Nicholas F. LaRusso, M.D., who was then the center’s medical director, the Mayo Clinic Department of Medicine envisioned a “living lab” that would allow specialists to study how health care in experienced and delivered to patients. The outcome was Mayo Clinic’s unique Multidisciplinary Design Clinic in the Gonda Building, 12th Floor. This space is a versatile environment that brings health care providers together with patients in a space that allows experimentation with care model prototypes with the goal of creating the optimum health care experience. Modeled after a scientific research laboratory, where hypotheses are piloted, observed, tested and improved, the Multidisciplinary Design Clinic functions as a setting in which providers experiment with health care delivery methods, prototypes and processes. Working directly with patients and providers allows rapid prototyping with all stakeholders to discover new insights and address problems in the current system of health care delivery.